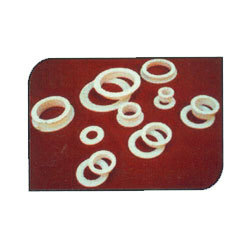 We are a leading Manufacturer of silicone o rings, ptfe o rings and o rings from Ahmedabad, India. 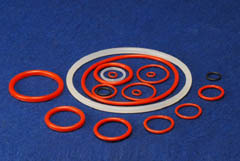 We produce a wide range of Silicone O Rings from ID 1.0 mm to 700 mm from its 7000 single piece moulds. We have also profitably drafted viton O ring of ID upto 3000 mm. These O rings are manufactured on a hydraulic press with tightly controlled temperature and time, and ensures accurate dimension, excellent finish, invisible flash line, properly post cured and absolutely defect free. We provide a wide range of filled and unfilled engineering PTFE O Rings for all elements of industries along with Valve seats, Pump, Diaphragm, Chevron Packings, Nozzles, Bellows, Guides, Bearings, Electrical insulators, etc. They are brought up with design assistance or to be Customer drawing. Resistant towards radiations and chemicals. RAJ ELASTOMER, offers it's wide range of O-rings from 2.0 mm ID to 600 mm ID from its 5000 single piece moulds. O-Rings are manufactured on a hydraulic press with tightly controlled temperature, Pressure and time which ensures accurate dimensions, glossy finish, invisible flash line, properly post cured and absolutely defect free. 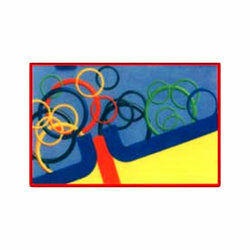 hese O-rings are also manufactured as per the dimensional tolerance specified by the customers and available from NBR, Neoprene,EPDM,Viton and Silicone Rubber or in any other rubber as per customers specification. We also manufacture O-Rings upto 3000 mm ID or in any sizes through step moulding process which gives joint less O-Rings of dimensionally accurate and excellent workmanship and finish. Looking for O Rings ?